Firstly, thank you for all of your blogs about the economy. For a non-economist that are logical and easy to follow. I would be really grateful if you could briefly describe the meanings of terms such as "export tax", " excise relief" etc. 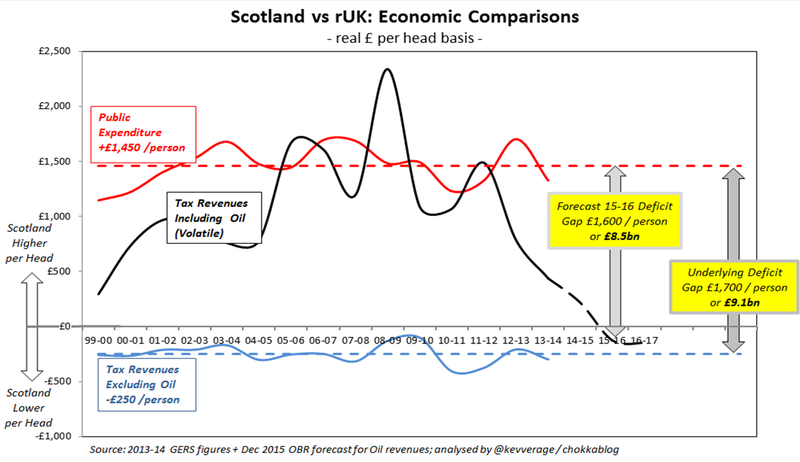 I have friends who are telling me that Scotland 'loses' much of its revenue at the moment due to these monies not being accounted for in figures such as the GERS figures and therefore that, in the case of FFA or independence Scotland's revenue would actually be a lot higher than the GERS figures would suggest. Is this correct? I have looked online to try and find an explanation but have had no luck. In this "GERS misses chunks of revenue" nonsense - how stupid do they think the Scottish government are to have failed to take this into account? Of course they haven't missed anything in the numbers they used to write the White Paper for heaven's sake! An excellent précis of your previous blog. 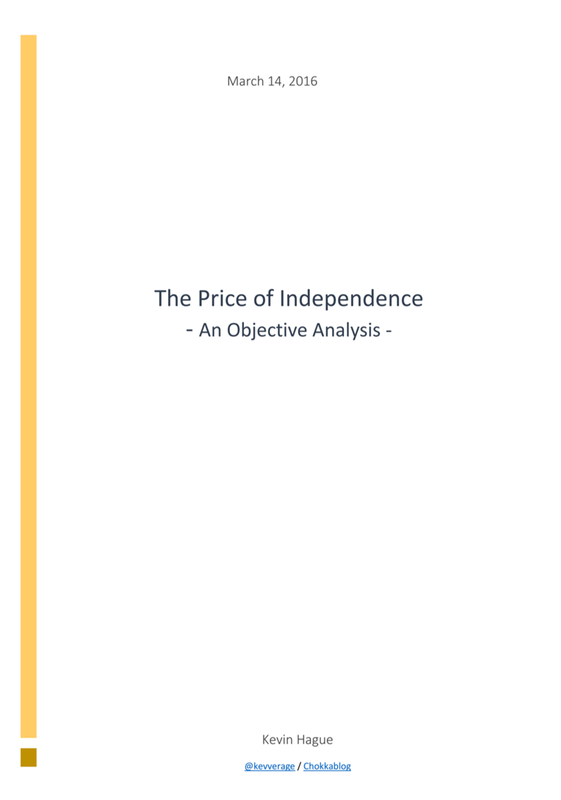 The more one looks at Scotland's balance of income over expenditure, the more it is clear that, for practical purposes, the Barnett formula compensates for Scotland's geography. This geography is not going to change any time soon. Ergo, Scotland could do with extra cash from the more centralised rUK, more-or-less in perpetuity. The seductive prospect was undoubtedly that a resource grab for oil would offset the geographical problem. If the oil revenues largely disappear, Scotland is heading for relative poverty and the best prospects for most young Scots will be the road to England and Europe. If the Scots really want to see how an open economy of their size would operate, they need only look at New Zealand. New Zealand, with 4 million, has to operate a ruthlessly efficient set of state services, because it does not enjoy economies of scale or sharing. It has independently to provide for its armed services, a reserve bank, border control, etc. Those familiar with New Zealand will tell you that even the Centre-Left is way to the right of where the Centre-Right was 40 years ago. And despite Centre-Left governments of some durability (think Helen Clark), all governments have been punctilious in preserving some sort of working relationship with the US and Australia. Although New Zealand has its own currency, it has to pay considerable attention to Australia, which is not even half the size of rUK relative to Scotland. New Zealand is, of course, a sovereign country, and punches above its weight. However, it is fully aware that sovereignty produces only limited independence. Like an independent Scotland, it has a large area for its population, and knows all about the tyranny of distance. The SNP's so-called economic levers have all been tried by New Zealand, without any evidence that they enable New Zealand to leap-frog its rivals. Moreover, its universities, which are solid, could not possibly hope to aspire to the international position of Scotland's major universities without greatly increased levels of investment that New Zealand could not afford. The conclusion? Sadly, an independent Scotland will show signs of decline from day one. The Quebec effect will kick in and many of the brightest will simply get out. The quality of services will decline progressively, and the universities will show a very sharp decline. Sad, and completely unnecessary. Maybe an intrepid political interviewer needs to raise the subject with Ms Sturgeon and get her to make a definitive statement supporting the Scottish Government's GERS figures as an accurate statement of the position of the Scottish economy. I came across this link whilst reading comment on an article in the Scotsman. It is a wee gemm of information.